SpaceX ushered in a new era of space travel today, with the successful launch of Falcon 9 – a feat founder Elon Musk believes puts space exploration in the same boat as the web in the mid '90s. 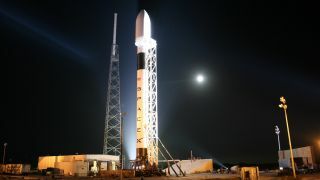 Speaking at a press conference about the launch of the Falcon 9, Musk explained the feeling he got when the engines of the rocket lighted – a moment he had been waiting for more than two years and one that was delayed back on May 19 because of a valve problem. "Every bit of adrenaline in my body released at that point. It was an extremely intense moment. "The main thing I was wondering was if we would have a valve-related issue on launch but it worked properly – this is the first time we have deployed solar arrays in space. "Anything could have gone wrong but it all went right, we were very lucky." Musk was keen to point out the importance of what is the third successful flight by Falcon 9 and the first set to dock with the International Space Station, likening the shift in space travel to what happened to the internet in the nineties. "I think we are at the dawn of a new era of space exploration and one where there is a much bigger role for commercial space agencies. "There are some parallels to the creation of the internet in the mid '90s. It was originally made for the government, but commercial companies made the internet successful and pushed it into the mainstream. That's where we are now with SpaceX." "We are at the dawn of a new era of space exploration and one where there is a much bigger role for commercial space agencies." Musk created Spacex back in 2002 and since then the company has grown to 1,700 employees. The PayPal and Tesla Motors founder is dreaming big, hoping that SpaceX's rockets will "revolutionise space travel and eventually make it possible for people to live on other planets". At the moment, though, the rocket's job is to cater for the ISS – something it has now proven it can do. "The success of the mission so far will dispel some of the doubts some people have [about SpaceX]. There is no precedent for what we have done here," explained Musk. "We have had three successes of Falcon 9, two successes with the Dragon and hopefully have a success with docking with the space station. "We do need to have to go through a number of steps to dock with the space station. I would count today as a success, no matter what happens next with the mission." For those reading this thinking their dreams of science fiction are coming true, Musk did dispel a rumour going round that James Doohan, who played Scotty in Star Trek, had his ashes on the flight. Although it was confirmed that a Celestis pod was on board, so maybe he just wasn't informed that the late actor caught a ride on his flight. Musk did hint at some film references though – other than the fact Falcon is named after the Millennium Falcon – noting: "The next thing is for us to open the navigational door – we have a tiny pod bay door that we need to open and latch the navigational sensors to lock on to the space station. This is also where the grappler is. "The door is a tiny version of what's seen in 2001: A Space Odyssey." Consider our geek buttons pressed.